Born in 1915, James Gleeson is highly respected in the Australian art world not only as an artist, but also as an author, critic, and lecturer. Gleeson was born in Sydney and bought up by his Aunt and Mother, as he was three when his father died. His mother had a heart condition and he looked after her from 1942 until her death in 1958. Gleeson trained at East Sydney Technical College from 1934-36. He then went on to study, and later lecture, at Sydney's Teacher's College. From 1949- 1972 he was art critic for the Sun and from 1962 for the Sun Herald. Throughout his life Gleeson traveled moderately, visiting Europe, the States, South America, South Pacific and Japan. He was President of the Contemporary Art Society, NSW, Director of the Sir William Dobell Art Foundation and appointed to the Commonwealth Art Advisory Board in 1972. Macquarie University awarded Gleeson an Honorary Doctor of Letters, and in 1990 he was made an Officer of the Order of Australia. In 1987 he won the McCaughey Prize with Harbinger. Gleeson's paintings are held in all State Galleries and the National Collection. Influenced particularly by artists such as Salvador Dali, Hieronymous Bosch and van Gogh, Gleeson succeeded in becoming Australia's first and foremost surrealist artist. He invites the unconscious to appear seeking fuller self knowledge. Like many of the Surrealists, Gleeson kept paper and pen beside his bed to record his dreams and used various painting techniques including frottage, decalcomania and impasto. 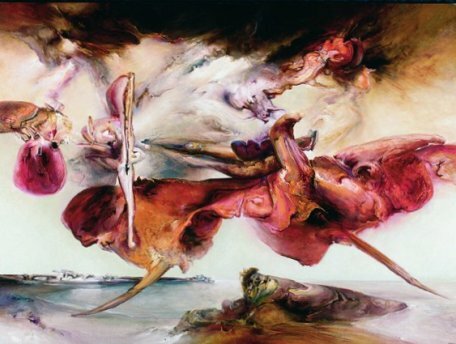 Gleeson's paintings during the Second World War capture the emotion and plight of humanity; The Citadel, 1945 is a counterpart to Dali's The Face of War focusing on death. These paintings "are the most significant anti-war statements by an Australian artist"^. After the war Gleeson started the Garden paintings which often embrace mythology, although are predominantly involved with the separation of woman and man, animal and ego. He continued these paintings in London where he developed a close friendship with Robert Klippel. In these later images, the influence of European painters is seen, with Gardens of the Night, 1947, described as being "like a nightmare in Tintoretto colours"^^. The series culminated with Agony in the Garden, which summarized the major symbols of the earlier period. In the seventies Gleeson turned to the technique of collage and produced the Locus Solus Series taking inspiration from Roussel. The pastels from 1979-82 symbolise a wild rage at humanity deconstructing the previous idea of man as the measure of all things and linking up with his earlier thoughts of man being limited. They rage against the mythical, the biblical, and even art itself. By 1983 the artist had pushed the extreme of the figure so far that to him it had almost become unrecognizable, hence his work became more abstract as he no longer felt the need to use form at all. This resulted in his later works being mainly oil on large canvasses and is particularly pleasing, showing how Gleeson's struggle within eventually matured to a more calm, balanced depiction.